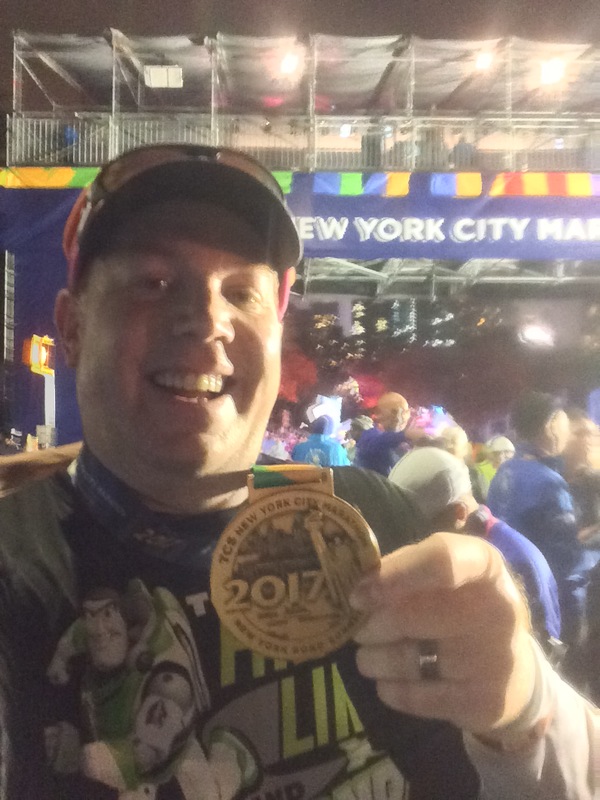 Before I get to recapping my NYC Marathon Trip, I wanted to put this post out. 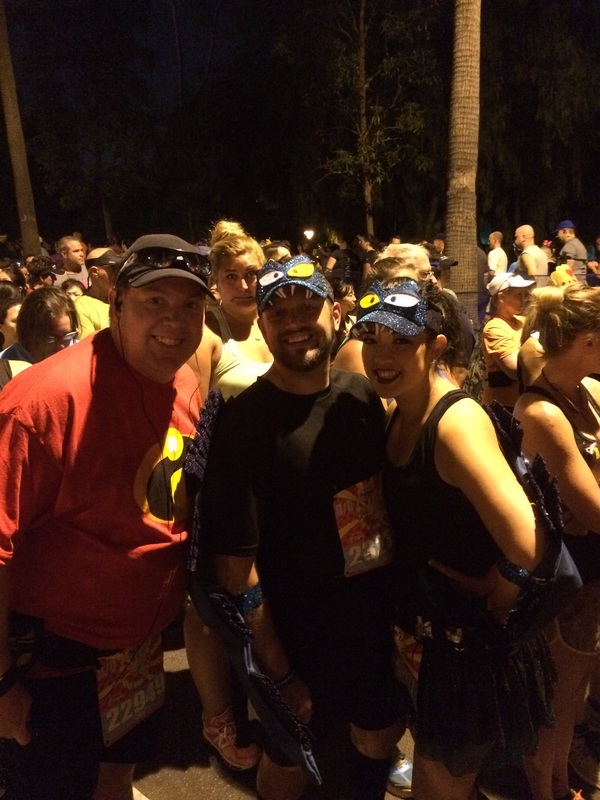 This past weekend, runDisney ran it’s (potentially) final race at the Avengers Super Heroes Half Marathon Weekend. The official word is that the races are in an indefinite hiatus at Disneyland. 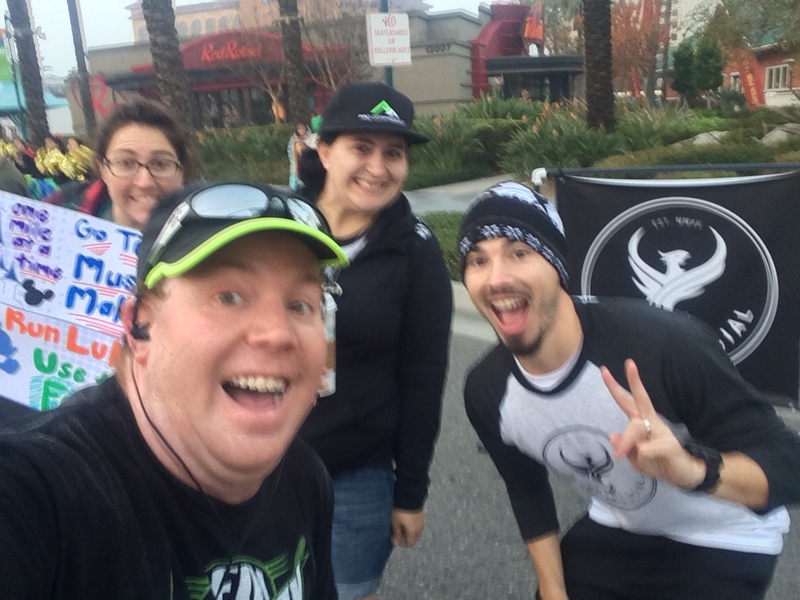 As a runDisney fan and California resident, I’m sad to see the races take a break because runDisney is what got me into running to begin with. Back in January of 2012, I ran in the inaugural Neverland 5K at Disneyland. It was my very first race. I signed up to give me something active to do other than going to the gym. The race started at 11pm inside of Disneyland and finished on Paradise Pier at DCA. I knew nothing about running back then. It was actually my first time running away from a treadmill. I had so much fun that I decided to do some more 5K’s and eventually 10K’s. However, my first 5K was run at a runDisney Disneyland race. 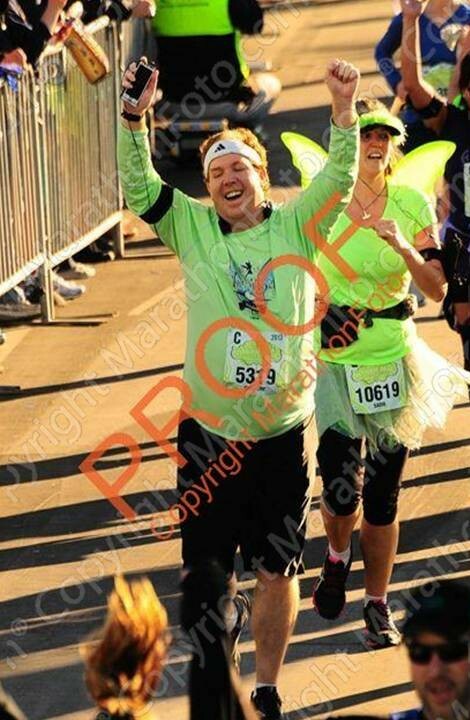 A year later, in January 2013, I ran in my very first half marathon at the Tinker Bell Half Marathon. I had done next to no training for this race and almost didn’t do it. However, my wife convinced me to at least try. I’m so glad that she did that. It was finishing this race that truly started my journey as a runner. 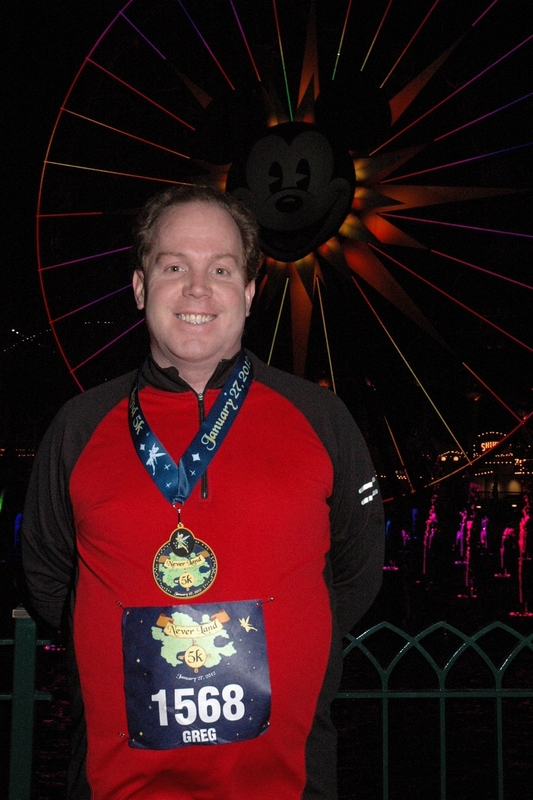 Later, in 2013, I set my current runDisney half marathon PR when I ran in the Disneyland Half Marathon. 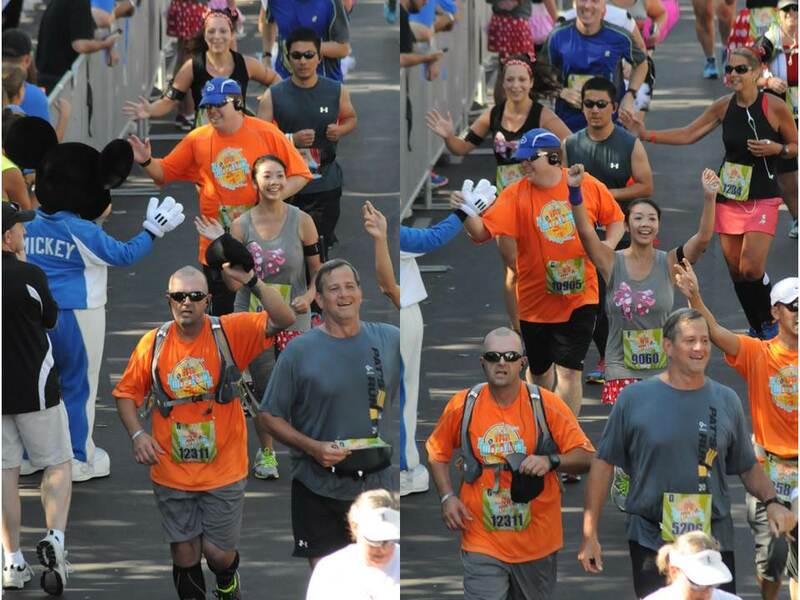 I even got to high-five Mickey on the way to the finish! In January 2015, I got my absolute favorite race photo ever! 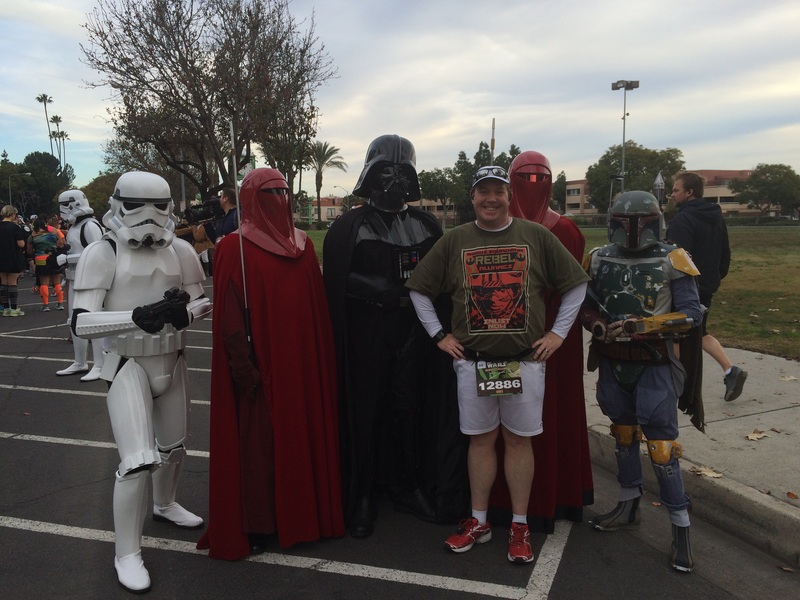 This one was at the 2015 Star Wars Half Marathon (before it was named the Light Side). The best part of this picture is that I only had to wait 2 minutes to get it. The line for Darth Vader in Disneyland was over 20 minutes. I got this pic with not only Darth Vader, but 2 Imperial Guards, a Storm Trooper and Boba Fett! Bringing out the members of the 501st was a brilliant move on runDisney’s part. 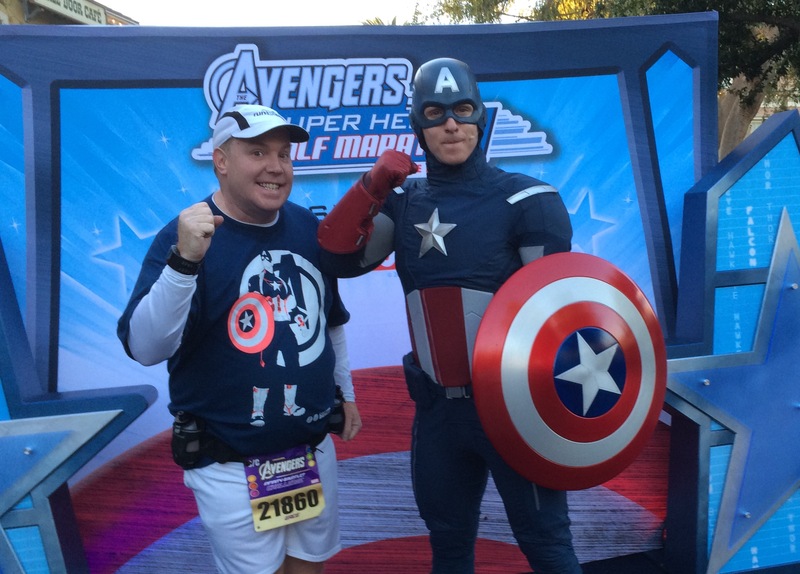 This pic with Captain America in the Captain America 10K is a close 2nd place to favorite race photos. 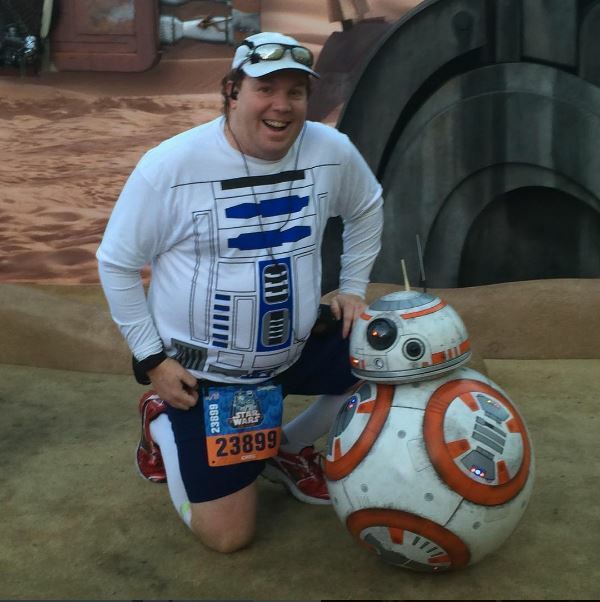 Next up is this pic with BB-8 at the 2017 Star Wars Light Side 10K! The line was long, but I made it to get the pic and didn’t get swept off the course! The thing that bums me out the most about the possibility that runDisney won’t run another race at Disneyland is that I may never get another father son medal pic like this. 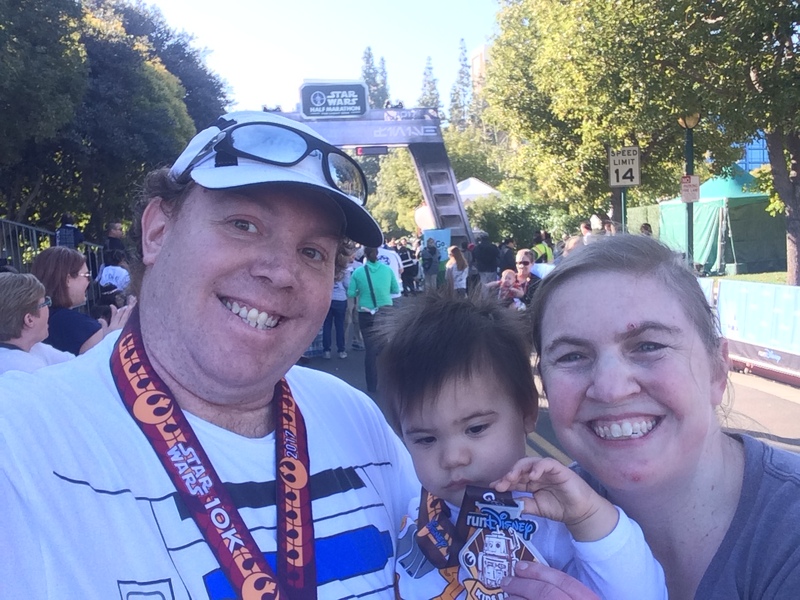 I had hoped that Colton could run the Star Wars kid races every year and eventually the Star Wars 5K with me. 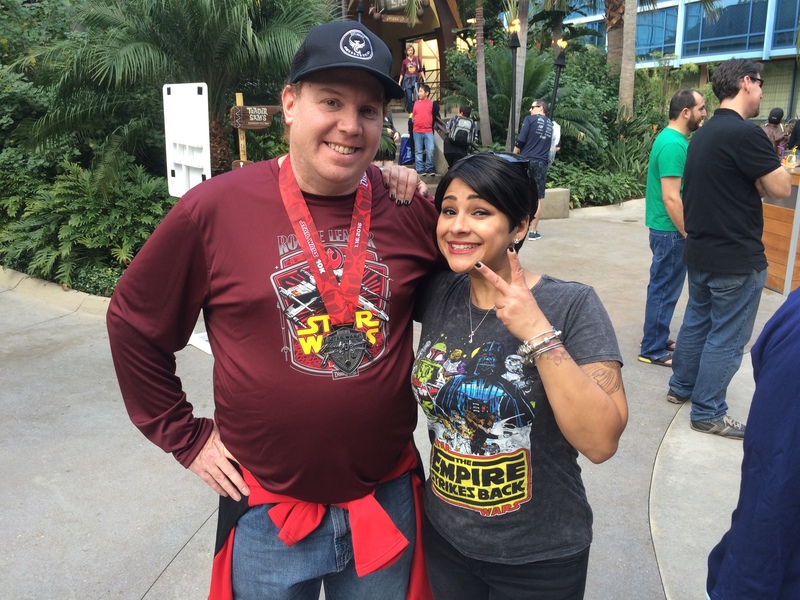 The Star Wars Half Marathon Weekend was going to me the race I never missed. 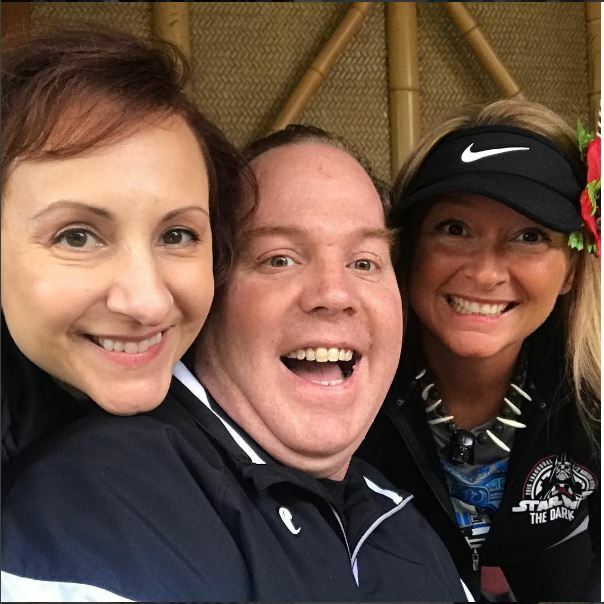 What I’ll miss most is the chance to see my running friends who live in different parts of the country like Kim and Gail…. 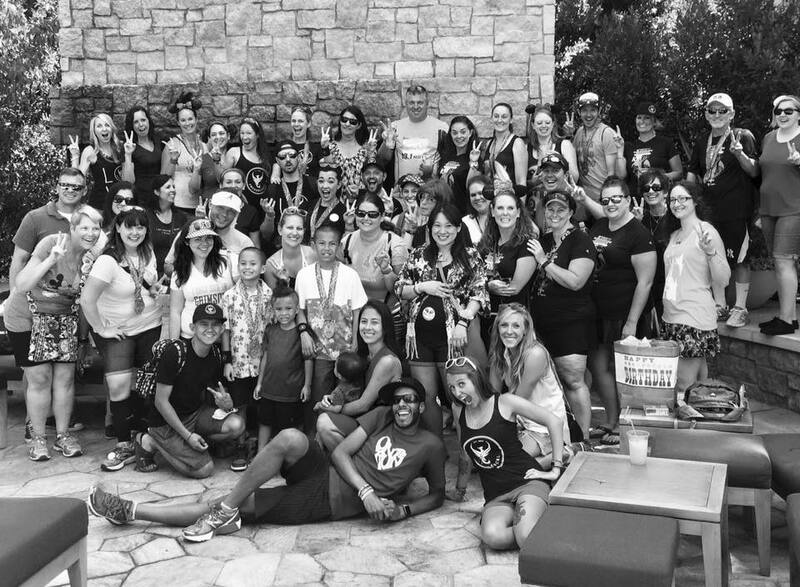 #TeamRunDisney facebook group meet ups and more. 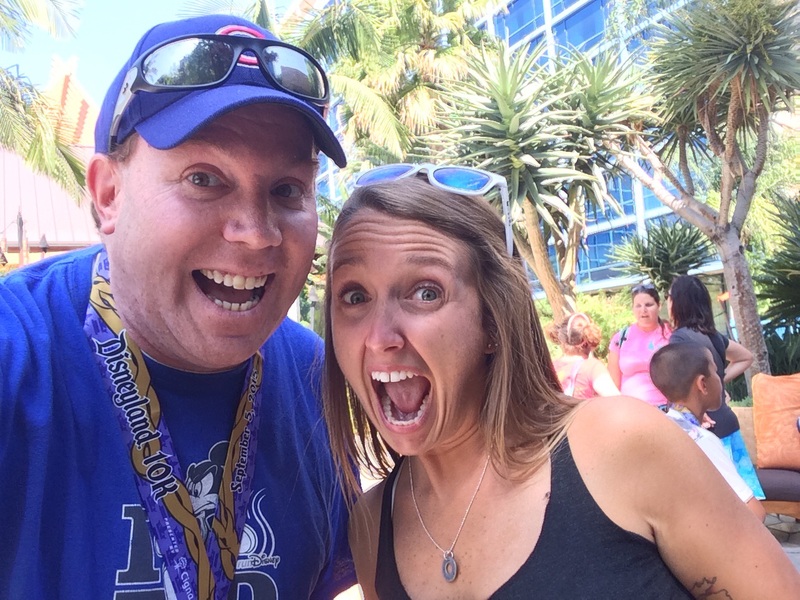 who brought the We Run Social crew to Disney races and beyond. We have all missed the pairing of Rudy and Carissa the past few years. Fortunately, for me, Rudy performs race MC duties all over Southern California! 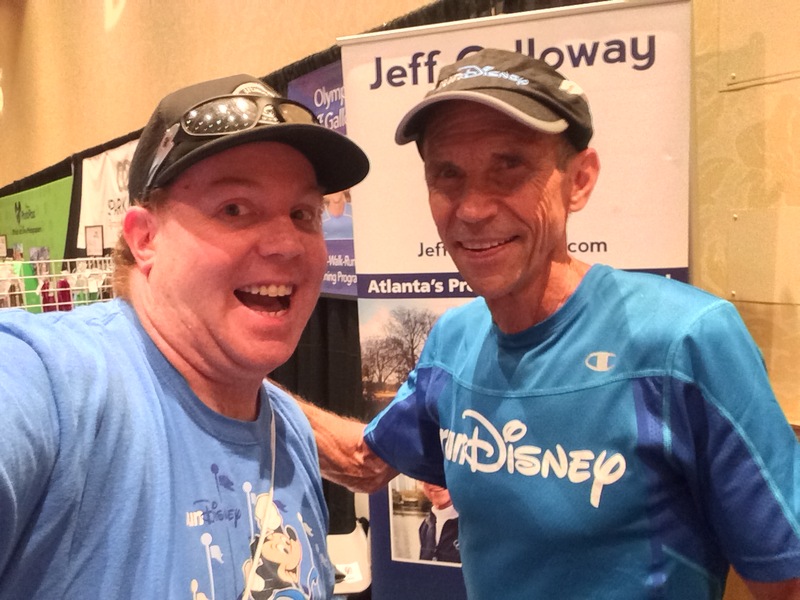 Of all the wonderful people I’ve met in the runDisney community, none has had more of an impact than being introduced to Jeff Galloway and his run, walk, run method for long distance running. If not for this method, I would have likely never even attempted a full marathon. This past weekend, I made my way down to Disneyland to see the Expo one last time. I got to talk with Jeff. He’s such a nice person. 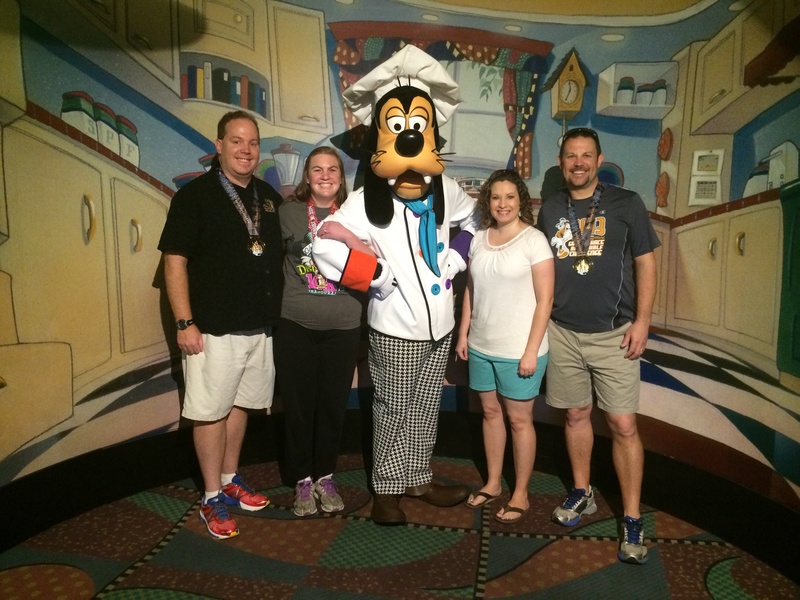 He gave me a piece of advice as I embark on my Boston Marathon Qualifying dreams….make sure to have fun along the way. He warned me of how so many burn out in pursuit of faster times. So, he told me to keep the fun in running and I should be okay. Good advice. 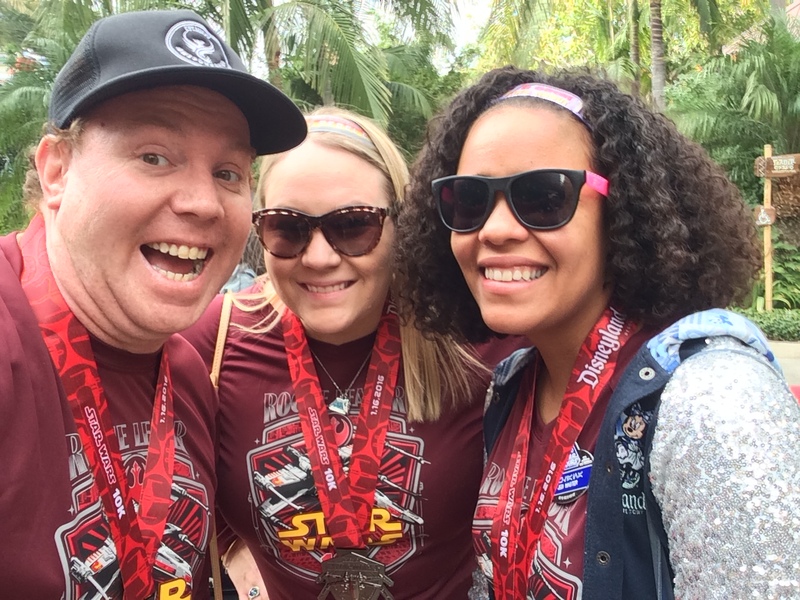 I ran in the first three Avengers Super Heroes Half Marathons. This year, I skipped the race. 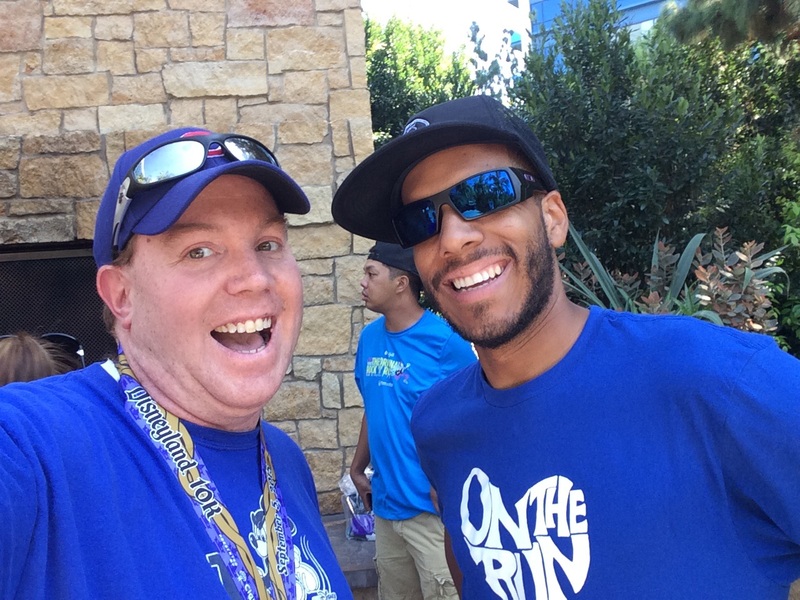 Once it was announced that runDisney was halting their races at Disneyland for the foreseeable future, I was tempted to sign up for one last runDisney race weekend at Disneyland. However, I ultimately opted against this. Why? Well, this year’s Disneyland Half Marathon was my least favorite. 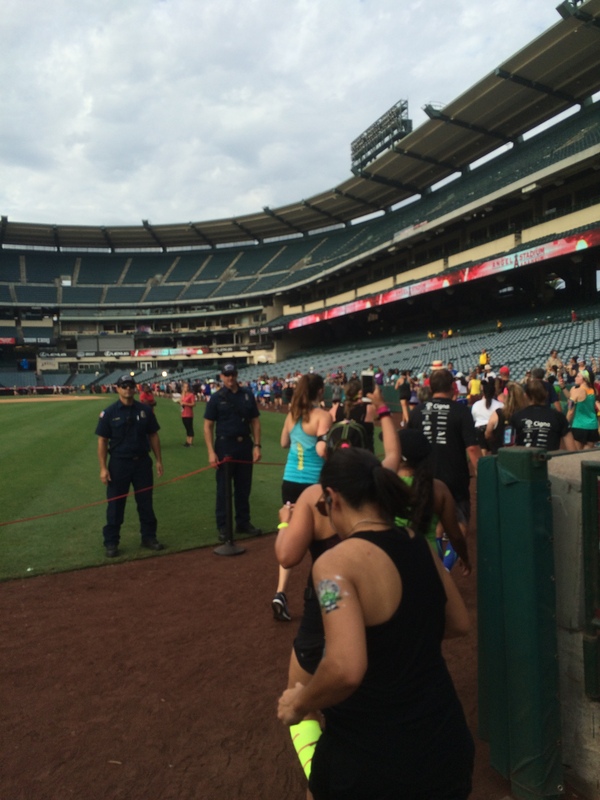 The highlight of the running in the Disneyland Half Marathon was running through Angel Stadium. 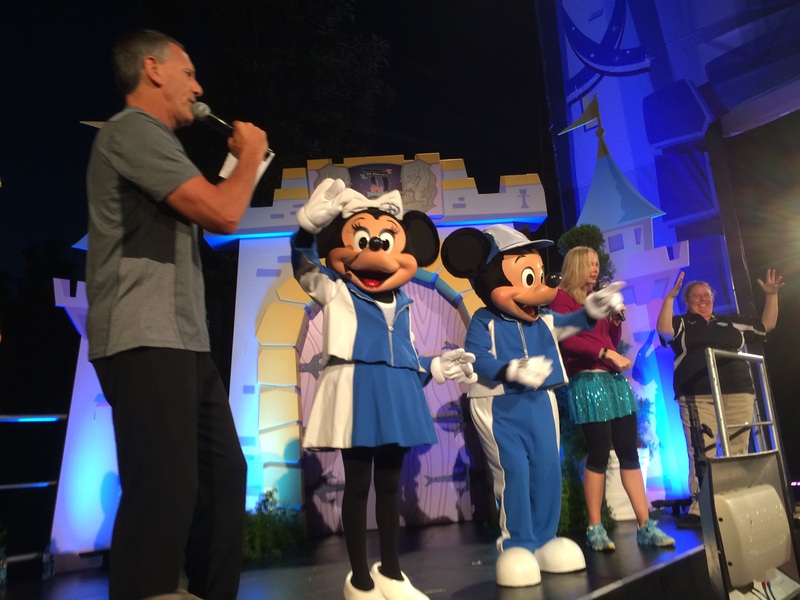 The folks at runDisney organized this kind of amazing crowd to greet us in the past. This is what we encountered this year. An empty stadium. It’s as if the wheels were falling off at runDisney Disneyland. So, I thought that this one last weekend would be disappointing. As I walked the Expo floor this past weekend, I was proved to be correct. I’ve never seen a runDisney Expo with so much empty vendor space as this one. 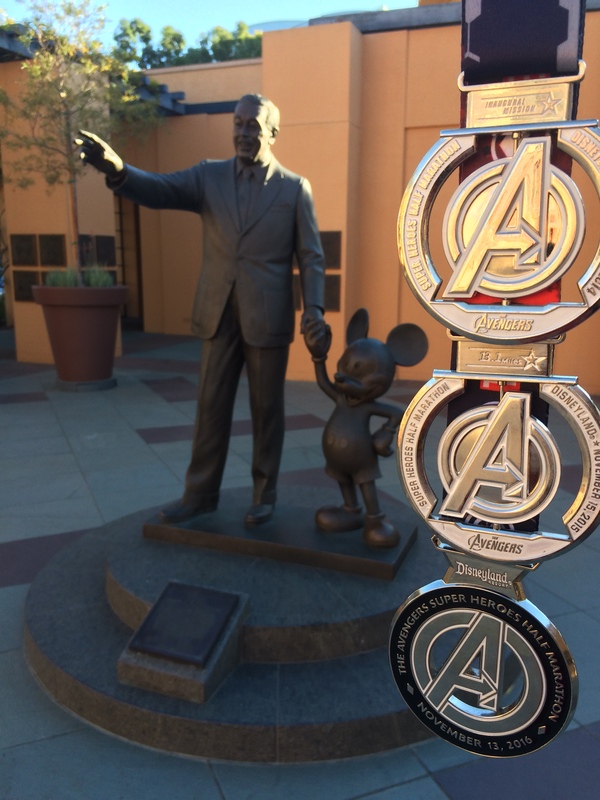 While I hold out hope that runDisney will come back to Disneyland, it wouldn’t surprise me if the 2017 Avengers Super Heroes Half Marathon is the last race run at Disneyland either. 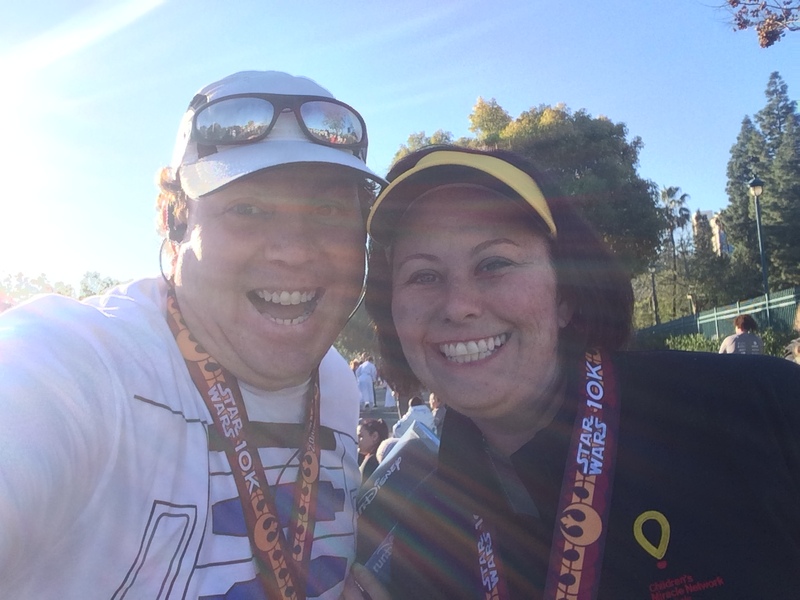 If that is indeed the case, all I can say is THANK YOU runDisney for so many great memories. 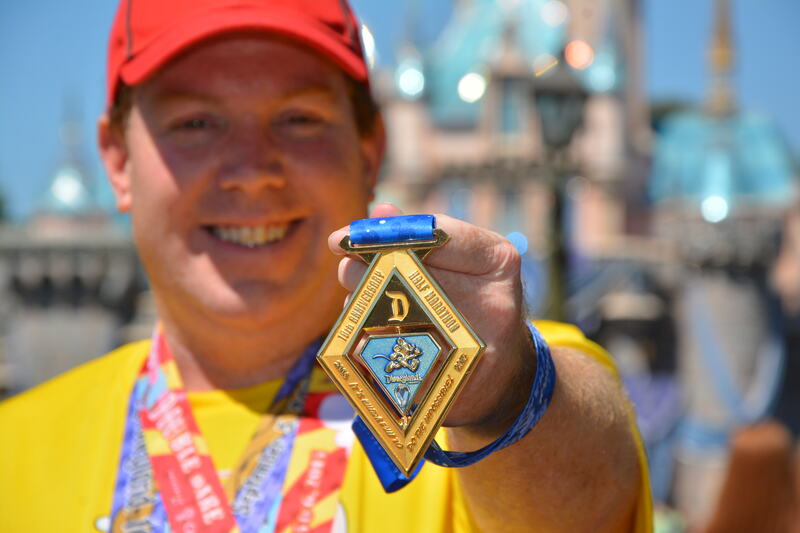 If I end up running the Boston Marathon someday, I can thank everyone involved in the runDisney races at Disneyland for the role they played in inspiring this former runner hater to take on big, long, crazy distances like the half marathon and full marathon. It’s been quite a ride! No matter how much I’ll miss the races, the people, and the experiences, I’ll always be grateful for what running at Disney inspired. It was why I ran Disney. 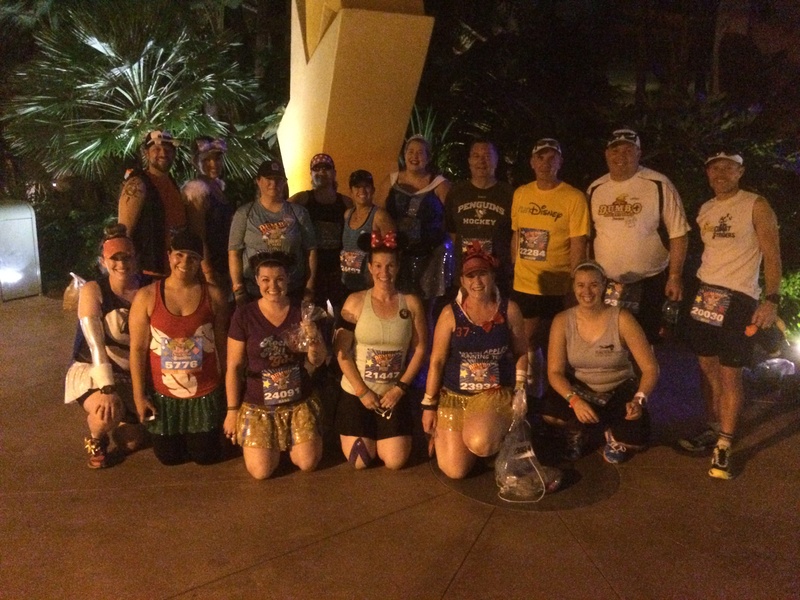 ❤ this post and the disneyland rundisney community. the only thing that has given me comfort is that this past weekend (the expo, the half marathon, etc) were NOT the rundisney i fell in love with. 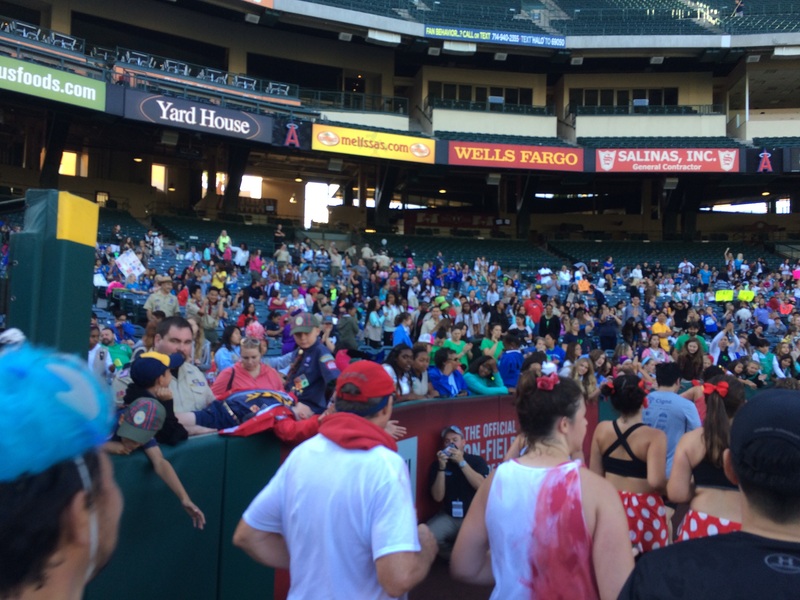 A super sad expo, sub par merchandise, a super boring run on the streets from mile 4-12 with less than 4 groups out, no one in angels stadium, no cosplayers, etc. i am not hopeful they will ever come back and im not sure how much more time wdw has left but I will always love the memories that I have had!